The hours of land travel had left me thinking that we have crossed the Philippine border and have landed in a different country :D They all cracked up at my statement, then told me that we are, in fact, STILL IN THE COUNTRY. The cool weather, zero-visibility fog, smell of sweet strawberries and everlasting are all welcoming treats of this city up North. That's why when the rest of the santayopuntathis2015 gang (IBM friends! Ais, Zen, Ging, Tle, Zsa and Heaths) suggested that we go to Baguio for the weekend, I was all geared up to go! We rode a Victory Liner bus going to and from Baguio. We decided to meet at the bus terminal in Cubao along EDSA, which has the big billboard of a smiling Bimby. Yup, that's the one! There's a deluxe bus (P715/person) which has comfier seats, wifi and restroom. So if you want to maximize time, this is the way to go because it will only take you about 5 hours to get to Baguio. For us though, we rode the regular aircon bus (P445/person) which also has wifi but no restroom, so we stopped over twice for the sake of our bladders. We left at 6am last February 4 and already arrived past 12pm... So that's more than 6 hours on the road. For me though, the regular aircon bus is already a good deal if you're on a budget. Almost P300 difference din naman kasi yun sa deluxe bus! :P Suggest to just take the bus that goes thru SCTEX and that leaves at midnight, so you'll get to Baguio early in the morning. Here's the Victory Liner bus schedule for all their terminals in Manila. There are many places to stay at in Baguio. You can choose from transient houses, microtels, hotels, B&Bs and you want to splurge a little on something fancier, there's the Manor at Camp John Hay. Agoda, Asia Travel and Airbnb are good reputable sites to start with which will give you options within your price range and reviews of the place. As for us, we stayed at this transient house that Tle stayed at before... so for just P350/person per night, not bad na! Since we'll be out most of the time, we'd really rather just shell out money on food and ukay-ukay! Speaking of food, there are many foodie places in Baguio. When we arrived, we were already starving so we had late lunch at Ketchup Community. This place is attracting tourists because it's a one stop joint for almost any type of food you are craving for. The most popular one (given its crazy long lines) is Canto, because of its hefty and delicious serving of ribs. Other restaurants at Ketchup Community include: Green Pepper (healthy eaters, come! 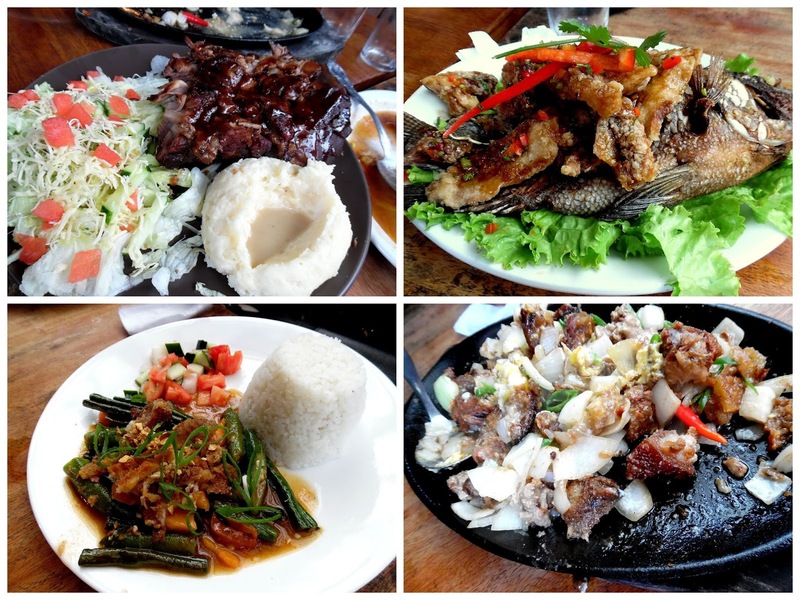 ), Rancho Norte (delish Filipino dishes! ), Rumah Sate and Happy Tummy! The place has an open space in the middle, so people can just sit, smoke or take pictures. A few tables are placed outside for every restaurant so people can dine Al fresco style. And when you're in Baguio, you just want to soak in the cool air, so plus points for the ambiance! As for us, we were supposed dine at Canto, but because there were no seats available (take note this was already around 3pm! ), we ate at Rancho Norte instead and just ordered the famous ribs at Canto (no corkage! Yaaay!) hehe! Odiba, mautak! After eating at Ketchup Community, we went around the streets, walked around Minesview Park and bought pasalubong at Good Shepherd! The city is known for selling plants, flowers and the freshest vegetables at affordable prices. Spot the price tag above! Bili-bili, murang-mura lang! Aside from taking in the sights, Mines View Park has shops selling clothes, bags and other native products! I bought a native blanket here at P200 and also chocolate flakes for pasalubong! Why do potatoes have all the fun? Mangoes can be cut into strips and dipped in flavoring too! These mango fries are best enjoyed coated in spicy sugar or spicy salt! Yummmy! I was taking view-less photos so Zen took the lead and took this shot! Yaaaay! :D Thanks friend! PS. Next 2 posts will show you more places to go to in the city! Awesome images in baguio city.